Greetings all and welcome back to the Draper’s Diary. We’ve had a busy month and can’t wait to share our latest news with you. Kevin is enjoying his classes at the Sem. This semester is a bit tougher than last as he has one additional class. He is happy that his class schedule allows him a later start on Wednesdays – no first hour class! He is using a laptop computer for the first time this semester, and it is proving to be quite beneficial for note taking. The Seminary has a wireless network, which is great! Kevin’s dream is to be totally paperless. This Tuesday, February 24th, Kevin will preach his first sermon for his class. Then next Thursday, March 4th, Kevin will preach for the school chapel service. I’m sure he would appreciate your prayers on these special days. He continues to serve as a student coordinator for the Seminary-led nursing home services and is active in our church as well. The boys are always busy. They are still faithfully practicing their instruments and earned an afternoon at a clown carnival to celebrate their practice. It was lots of fun. Stanley is busy drilling his multiplication tables and practicing his vision therapy. He is also working hard on his entry for the Pioneer pine car race. Luke and Ben use every spare moment to play! I, Sallie, had an especially eventful month. I was a beta tester of some new scrapbooking software that will soon be released from a company called Lettering Delights. It was fun to play with the software and report problems I found. I earned two free pieces of software for all my “hard work”. My biggest news, however, is that after 8 years of being a stay-at-home mom and working various part-time jobs, I have been blessed to returned to work full-time. I started my new job January 26th. I am working at the WELS Synod Administration Building on the synod web page (www.wels.net) as Help Desk person and Trainer. I’ve just finished my fourth week and am very happy with the job. I still have lots to learn, but I am finding ways to be productive. I find my days too short, but very fulfilling. We pray this finds you all well. Our busy days didn’t leave much time for picture taking this month, but I will share what I have. Please keep Sallie’s sister Debbie in your daily prayers, as she bravely battles cancer. See you in March! 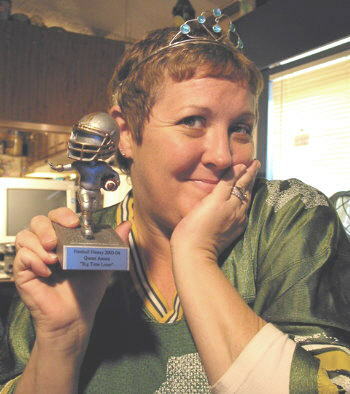 Sallie’s sister, Anona, shows off her trophy. She is this year’s Football Frenzy Queen!! This is the fifth year our family has played a football stats game. I’ve heard of being buried in sand at the beach, but Kevin decided to be buried in SNOW!!! Benjamin loves to smile for the camera. A quick shot of three Valentine’s boys.